Endogenous digoxin has been related to the pathogenesis of Schizophrenia, malignancy, metabolic syndrome x, autoimmune disease and neuronal degeneration. The possibility of endogenous digoxin synthesis by actinide based primitive organism like archaea with a mevalonate pathway and cholesterol catabolism was considered. An actinide dependent shadow biosphere of archaea in the above mentioned disease states is described. Metal actinides in beach sands have been postulated to play a role in abiogenesis. A hypothesis of cholesterol as the primal prebiotic molecule synthesized on actinide surfaces with all other biomolecules arising from it and a self-replicating cholesterol lipid organism as the initial life form is presented. The archaea exists as an endosymbiont in the human cell and can be considered as a cellular organelle. All cell organelles are basical endosymbionts according to the endosymbiotic theory of cell origin put forward by Lynn Margulis. The endosymbiotic archaea concerned cell regulation as well as neuro-immuno-endocrine-genetic-metabolic regulation is a cell organelle. The endosymbiotic archaeal organelle can be termed the archaeaon. 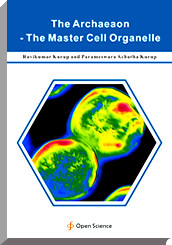 The archaeaon is the master cell organelle and the conductor of the cell orchestra.